The New Yorker has all the facilities a visitor could need for a stay in NYC. From comfortable, bright rooms to come back to each evening to friendly and knowledgeable staff, this hotel really does feel like a home-from-home. The hotel’s main lobby is grand – an intriguing mix of American 1930s décor and contemporary technology. Here, you’ll find places to sit as well as the reception desk and the exit out into New York City. With huge chandeliers and bright colours, this is a wonderful place to sit and relax before heading out to explore. Recent renovations have ensured that the hotel’s facilities are up to date – with complimentary Wi-Fi access across the whole of the hotel, and a premium service 44MB internet connection, there’s no need to go unconnected at the New Yorker. There’s also a business centre for conferences and those travellers in New York on work business. 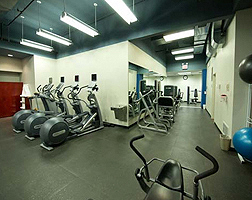 The New Yorker also offers a state of the art fitness centre which all guests have complimentary access to – with a range of gym equipment, guests have the opportunity to keep up their work-out schedule from the privacy of their hotel. The Tick Tock diner, within The New Yorker, is open 24-hours a day throughout the week – so if you fancy a coffee before leaving the hotel, or a midnight snack, you can just visit the restaurant – or even better, they can deliver to your room!